This review is a challenge response to a previous review, which resulted in a scathing critique, comparisons to arugula, and a rating of 1.5. Think about your spice rack. Parsley, basil, garlic salt, etc. Unless you are a semi-pro chef or watch a lot of Rachael Ray, you probably have a bunch of spices that are several years old. Maybe you actually have the original spices that came with the spice rack from Crate and Barrel. Nothing wrong with that. But think about how different that dried, 5-year-old parsley tastes compared to fresh parsley from Whole Foods. The older one has a hint of taste, while the fresh stuff blows your taste buds away. When you first taste this beer, there is quite a shock. 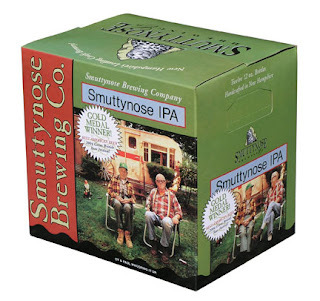 It seems like it is incredibly hoppy, which is not easy to do in this age of super-hop beers. 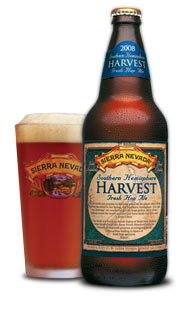 But most of the hop flavor in this beer comes from the use of freshly harvested hops. Naturally, this imparts a very different flavor profile than a typical beer using indeterminately-aged hops. Just like the parsley. I believe that the brewers at Sierra Nevada have created something very unique and delicious. And it is worth recognizing the tremendous effort that they went through to make it happen. Making a harvest ale with fresh hops is nothing new. There is an entire beer festival in Washington for beers that use fresh hops as an ingredient. But, when is the harvest in the US? When you go apple picking, in the fall. So, in order to get around the lack of fresh hops, Sierra Nevada put a bunch of freshly picked hops on a plane from New Zealand and brought them to Chico, California. Picture that! A 747 full of hops, flying 7000 miles just to make this beer! In terms of taste, the beer is terrific. The fresh hops give a more complex flavor to the ale. Most highly hopped ales tend to have a strong astringent sensation and flavor, almost in the aftertaste. This beer has that aftertaste, but also a notably flavorful taste of hops in the body of the beer. The color is mostly copper, and the beer has a hint of recently cut grass in its aroma. Definitely give this one a try, and let us know what you think in the comments. Note: I gave Beer Crusade a bottle of this beer, as I believe that the dramatic difference in our ratings might be due to a draft vs. bottle issue. This, my friends, is one of my most favoritest beers in all the whole wide world. Yep, you read that right, most favoritest... Arcadia's Hopmouth is a double IPA, with an amber color that pours absolutely perfect on a warm summer's night. In addition to the hops, you'll notice a slight caramel undertone which is just like perfection in my mouth. And at at robust 8.1%abv, it does the trick while making a bad day slightly better. For the longest time, I assumed that Arcadia was out of Maine, but apparently I was wrong as it's actually brewed in Battle Creek, Michigan. This just goes to show how not so bright I can be (looks like i confused Arcadia with Acadia, not my proudest moment). And all this time I thought I was supporting a local brewer. I think I really need to start reading labels more carefully. For all of you out there looking for a hop-erific new beer, I highly recommend you give this a whirl. It says it's a double IPA, I'd say it's more of a 1.75 IPA, but still definitely worth the trip to the store to pick some up. I've actually tried quite a few beers from the Arcadia Ales brand and must admit I have yet to be disappointed. I give the Hopmouth a solid 4.5, mostly because it has just about the perfect amount of hops for my ever so refined pallet. Now it's no secret I like IPAs and Dogfish Head, so it was only natural that I try the 75 Minute Cask Conditioned IPA when I saw it on tap. Now cask conditioned means it is served at 55 degrees, or cellar temperatures. When I tried this beer it was a little warmer than I am used to, but still manageable. The beer was fruity and creamy, but the flavoring was like a reduced version of the 90 Minute IPA, i.e. not as much kick, which makes sense because this one is only a 75 minuter. The beer is lightly carbonated and carries a 7.5% ABV. I thought the taste of the beer was superb and give it a 4.0. Also due to this beer being released only in casks I had to come up with something for the picture and well my graphic designing could use some work. 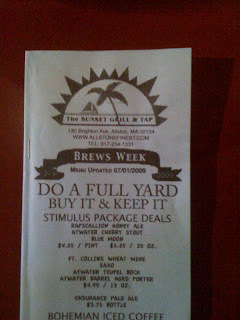 Editor's Note: I had this beer again a few days later and it was served much colder than when I tried it originally. The coldness definitely presented the beer a bit differently, as it was only a sip I chose not to re-review the beer, but this just goes to show that the circumstances of when beers are tried can definitely impact the review process. Fresh kegs vs old kegs, bottles vs draught, these things definitely change the taste and feel of a beer. Remember that Seinfeld episode, The Comeback, where Elaine and Kramer argue over who's employee's picks are better at the video store, Gene or Vincent? And Vincent is upset when Elaine chooses a "Gene" Recommendation? Well, after the Knight of Saint Arnold's recent comments on my Southern Hemisphere Harvest Fresh Hop Ale review, I demand satisfaction and thus demand that he review the Fresh Hop Ale. Also, I ask that you, the reader, also try it and see who you agree with. The Gauntlet has been thrown down and I welcome all challengers. Just realized I hadn’t posted “Notes” in a while. Couple things to check out on the site. At the bottom of the page where it says “Subscribe to: Posts (Atom)”, you can click on this to add Beer Crusade to your favorites and it will let you know when Beer Crusade has been updated. Also Facebook members (if logged in), can click at the link at the top of the page and add Beer Crusade as a friend. Our reviews are posted on Facebook a few hours after they are posted on the blog. You can now also “DIGG” our reviews at the bottom of each post, as well as send them to your friends. Also as you saw yesterday, you asked for the Chelada and you got it. We are always looking for suggestions, so please keep them coming. As you can see, we are willing to try anything at least once. Also for the commenters out there, I brought in Knight of Saint Arnold and Pale Ale Guy to broaden the scope of the reviews and maybe get some Belgians reviewed, yet KSA hated his Belgian and I loved mine. Pale Ale Guy even gave us the lowest rated beer yet. Check in tomorrow, we have another great review coming. Indiana: Give me your torch. [Sallah does, and Indy drops it in] Indiana: Snakes. Why'd it have to be snakes? And this is exactly how I felt. Sure, the floor wasn't moving, and there was no chance of me getting bit, but Mr. Jones shared my sentiments exactly. My fellow beer crusaders made me jump down into that pit first to try a Chelada which is Clamato and Bud Light mixed together... perhaps the most disgusting and repugnant drink ever created. One third clamato juice (for those of you who don't know what that is, it's tomato juice and clam juice mixed together), two thirds Bud Light and all nastiness. The drink is supposed to be light and breezy for a warm summers afternoon, but all it tasted like to me was thick, salty, slightly carbonated tomato juice. And yes, I will admit, that I didn't even make it through an entire glass. About ten solid sips in, I threw in the towel. For the record, I'm not a huge tomato guy to begin with, so that may have skewed my judgement on this one. When the first sip hits your lips, the first thing you taste are the pungent tomato's and the bite of the salt, and boy is it ever salty. It's so salty, that I really didn't even taste the beer even though its 2/3 the ingredients. The alcohol content is tough to measure as it comes solely from the beer you use. There are some premixed concoctions on the market, but I was not able to find any in the fifteen or so different liquor stores I tried. I'll be the first one to admit, I am not the biggest fans of Belgian beers. My record in rating Belgians is what it is. In fact people were horrified that their beloved Chimay was rated only a 3.0 and deemed my ratings "suspect". I get it, some people love when their beers taste like Glade Air Freshener and I do not. However, despite my anti-Belgian propaganda, I still tried the N'ice Chouffe on recommendation from a bartender. It was friggin terrific. The beer's malt tasted like roasted cherries. The N'ice Chouffe was very light bodied, but still was heavy on flavor, in fact it resembled an after dinner liqueur in it's satiny viscosity. The 10% ABV tells you how strong the beer is, but you don't get much of the alcohol bite when sipping the beer, however the aroma lets you know the alcohol is in there. The N'ice Chouffe is well deserving of a 4.0 rating. 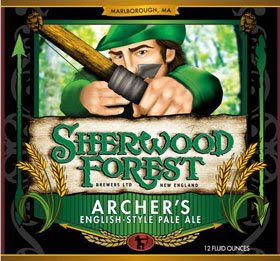 As far as I can tell, Sherwood Forest Brewers is the only active craft brewer in Marlborough, MA. I don't know if that is a bad thing or not, but these guys can make a very good beer. 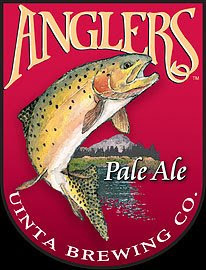 Their flagship beer, the English-Style Pale Ale, is full of malty deliciousness with a nice dark red color. There is some hop flavor in the aftertaste, but only a hint of it. Easy to drink, this one is probably 5.0% ABV (though the ABV is mysteriously unpublished). With a name like English-Style Pale Ale, I was expecting something like a Bass Ale. While the two beers are similar, I think I'm liking the Sherwood Forest product a bit more. You'll have to excuse me loyal readers.. I know I was supposed to deliver a Clamato review, but due to unforeseen circumstances, that'll have to wait a week. Instead, I have a Heineken Dark review ready to roll. This beer.. well to be frank, I'd never ever heard of it until this past weekend. An uncle introduced me to it, and I was actually pleasantly surprised. For the record, I'm not a green bottle beer guy for the most part. Heineken, Becks, Molson, none of these do it for me, but this..this was different (and as you can see in the picture, it didn't come in a green bottle like its brothers do). It poured as a dark brown color however, it didn't taste as dark as it looked. I was expecting much more of a malty flavor, but was surprised to find that it was almost IPA in nature and went down quite smooth. At 5.1%abv, it's pretty light on the alcohol, but I'll let that slide for now. I was actually at a seafood restaurant when I tried it, and it went quite well with my fish and chips. The head on the beer wasn't nearly as robust as seen in this picture. By the time it arrived at my table, there was very little foam to speak of. Without knowing it was a beer, at first glace one might have mistaken it for a Pepsi. Since my expectations were so low, I'm going to give this beer a solid 2.5. I'd definitely pick up a six pack this fall if I stumbled onto it, however, I wouldn't go and search for it. Vincent 'Vinnie' Antonelli: Arugula. I haven't had arugula in six weeks. 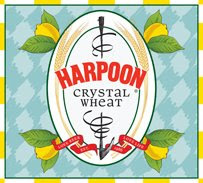 Harpoon Brewery in Boston, possibly in a fit of nostalgia over Crystal Pepsi, has introduced a new Crystal Wheat beer to their lineup. It's not a bad beer, by any means. It basically tastes like a Harpoon UFO that was filtered and flavored with lemon. It is a good example of the German Kristallweizen beer style, which is wheat beer with the yeast filtered out. The only downside is that the strong lemon aroma is somewhat "chemically", similar to how Pledge is "lemony fresh". It tastes fine in the beer, but it smells off. But, the same question for Crystal Pepsi needs to be asked: Why? Harpoon UFO is already a very good Hefeweizen (German for unfiltered wheat beer), and a lemon wedge is typically added to UFO when you order it at a bar. (I'm told that you can also add your own lemon wedge at home, but this couldn't be confirmed in time for publication.) Crystal Wheat is basically the same exact thing. In reality, this was probably a very easy beer for Harpoon to brew - take a UFO, filter it, and throw in a lemon. Done. Maybe there is a lot of pent-up demand for something like Crystal Wheat, but based on the fate of Crystal Pepsi, I'm going to go with "no". I wouldn't turn it away, but I'm not planning to purchase any more Crystal Wheat. Oh, and don't forget to sign the petition to bring back Crystal Pepsi. Just call me Lee Harvey from now on because I'm apparently the official patsy of the Beer Crusaders. 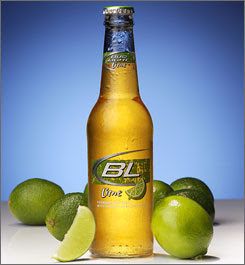 I reviewed Corona, I reviewed Bud Light with Lime, so what do my fellow authors demand I do? Review Miller Chill. Apparently I work for a democratic site as we took a vote and I lost. That being said, I am currently planning my coup to overthrow the Beer Crusade authorities and take my rightful place as the king. Miller Chill comes in at a low 4.2%abv. And without a high abv, what's the point in drinking it? I tried it a couple of years ago, when it still contained salt and it was disgusting. This go round wasn't as bad, but it certainly wasn't good. I tried the brew while sitting on my in laws patio, so my wife and both my mother in law and father in law gave it a try too. For the record, my wife hates beer and she thought Miller Chill was drinkable because it had no taste. My mother in law thought I should try mixing it with lemonade to give it flavor and my father in law (a beer aficionado that I aspire to be) described it as tasteless with a citrusy after taste. Problem is, we all agreed that the after taste sure as heck wasn't lime, so I'm not sure what it was. I'm giving Miller Chill a .5 rating and will never buy this beer again. I'm actually thinking of building a small memorial to the $8 I sacrificed to buy this banal beverage. In the movie Beautiful Girls, the protagonist Willie is asked by his friend Kev to rate his girlfriend based on face, body & personality. For each question Willie responds, "Good, solid, seven and a half." Essentially nothing excellent, nothing bad, middle of the road. This is how I feel about the Anglers Pale Ale. It does a lot of things good, nothing great, and more importantly nothing bad. The beer is creamy, light and has a very flavorful malt taste. 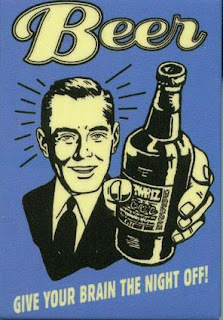 The kind of beer you can pretty much offer anyone who enjoys beer and they'll like it. Perhaps the only thing above average in this beer is the ABV which is 5.8%. The Uintas therefore gets a good solid 3.0 rating. Visiting some friends and family in Boston this week and I just had to swing by here. Their beer selection on tap and in bottles (they probably have like 80 beers on tap and the pamphlet above is like 12 pages full of bottles) is amazing and the food is great too. I may have to make a return trip. They bartenders are all super knowledgeable and I quizzed all of them on their favorite beers before ordering, many of them tended to have a Belgian as their favorite but they still could rattle off deleicious Pales and IPAs for me to try. The best part is, the draught beers can be sampled in 2 or 5 oz shots which allows you to really sample a bunch of things or only invest a little money before taking a risk on a beer. Heck, I even tried a Belgian in a 5 oz shot and it was real good, maybe I am changing my ways? Probably not. The second beer in my beers of summer review is relatively new on the scene. Bud Light Lime. It's only been around a year or so, but it has already carved out it's place in the summer beer market. When first opened, you're immediately hit with the scent of lime. Almost as if you were to put three or four limes into a Corona. The beer is light in color and light on substance, like a typical bud light and has a very low 4.3% abv. The dominant flavor is without a doubt, lime. In my opinion, if you enjoy Corona, you'll enjoy this beer, and the lazy among us will enjoy not having to cut up limes to put in the beer. Essentially, Budweiser saved us the pain of getting lime juice in the paper cuts on our fingers. If you were to pick up a six pack, it's not something you'd regret, although at the same time, I'm still very loyal to Corona, and don't see myself making the switch at any point. Overall, I'd give this beer a 2.5. In my humble opinion, the Corona is still king of the summer beers.